What does the install program do? Business Functions works with Excel 2016 for Windows. BF does not work with Excel for Mac or Android because these platforms have never fully supported add-ins. 1. Convert your models to MS's switch function simply by rearranging the arguments. 2. As soon as we have renamed the BF function BFSwitch, you can simply edit your switch formulae with the new function name. The residual cash functions in BF are really useful but they are a bit trickier to use. There is a very reasonable reason for this in that they nearly always exist as 3 lines that work together - interest, principal and balance. However, they are really useful, and the more advanced "array function" versions do things almost certainly faster and cleverer than you could yourself. 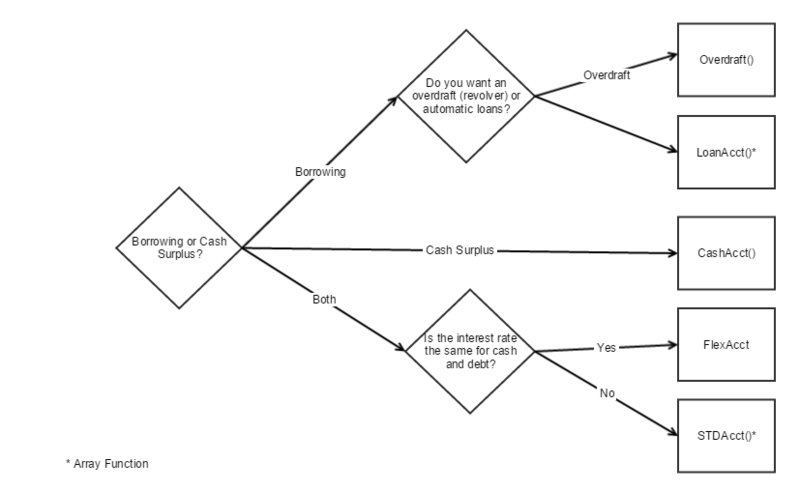 So I made this little chart to help you through choosing which of the basic Residual Cash functions fits your needs. It helped me anyway! Well, today we have split Business Functions into a FREE Edition and a MODEL BUILDER Edition, costing 50 GBP Both have the exact same function Library. The difference is that the Model Builder has a lot more menu options and tools designed to work wioth the library, so if you use BF a lot you should consider this. The cost is 50 GBP (pounds) for a 3 year License. We thought long and hard about this charge and figured that it is fair enough to try and recoup some of the cost of development, website, maintenance and bug fixing, etc. There is an active programme of new stuff in the pipeline, including Unicode support, but perhaps more crucially some training videos. Your suggestions are welcome as always. This is just to let you all know that, after a fair few years now where Business Functions is free, there will be a small charge for the full version. There will be a free edition and a "Model Builder" Edition, which has all the the features usually on the menu bar. ALL EDITIONS OF BUSINESS FUNCTIONS CONTAIN ALL THE FUNCTIONS. So there will be no inconvenience of "my model has stopped working". It's just that the Model Builder will contain the extra features that make it easier to build more complex models. The charge, which will be around 50-100 GBP for a 3 year License, will be introduced at the start of March 2015. Very occasionally, and we solve the problem when it happens, the library fails to register. What happens is busfun.xla or busfun.xlam loads as it should, but there is problem loading busfunlb.xll or busfunlb64.xll. If this happens, we will double check the Visual Basic xla and xlam files. What you can do is first of all check that the xll file does actually exist in the Business Functions install directory. Then, if you are in a desperate hurry to get going you can manually register the xxl file only. This will give all the functions but not any of the menus. To do this, go into Excel Options / Excel Addins and UNCHECK Business Functions. Ok to all that and then go into Options / Addins again and BROWSE to the appropriate xll file, either busfunlb.xll for 32-bit Excel or busfunlb64.xll for 64-bit Excel. Select that file and close the dialog box to go backj to Excel. Now at least your functions are all there whilst we help sort the VBA problem with the xla/xlam file.